*We try to keep our website updated, but services may change without being updated on our site. - foiling, retouches, all over colour, flash foils, Au Natural... there is no limit as to how we can make your colour come alive! - Permanent and clip-in extensions are available. Contact stylist for individual pricing. Enjoy the fresh lemon scent while feeling like champagne bubbles are rinsing away your stresses, followed by hot towels and a deep scalp massage. Give your hair the treatment it deserves, a hair repair treatment with deep scalp massage. This treatment repairs hair instantly for stronger more lustrous shine without the frizz. It can be applied at the sink and only takes an extra 15 minutes. Sometimes conditioner just isn't enough. This is the perfect solution for blondes who want the shine that all the exotic dark haired girlz have! Don't color your hair but wish your greys were softer, shiner and silkier to the touch? This shine gloss does just that. Don't worry you're still au natural! Please keep in mind when having a service done at EK Hair, as much as we love kids we do appreciate good behavior. We want to respect our other mom's "get away time" from their children. We have many items in the salon that could seriously harm your child or are expensive to replace. If possible please avoid bringing your children unless they are having a service done. Our floor space is very busy and very limited. 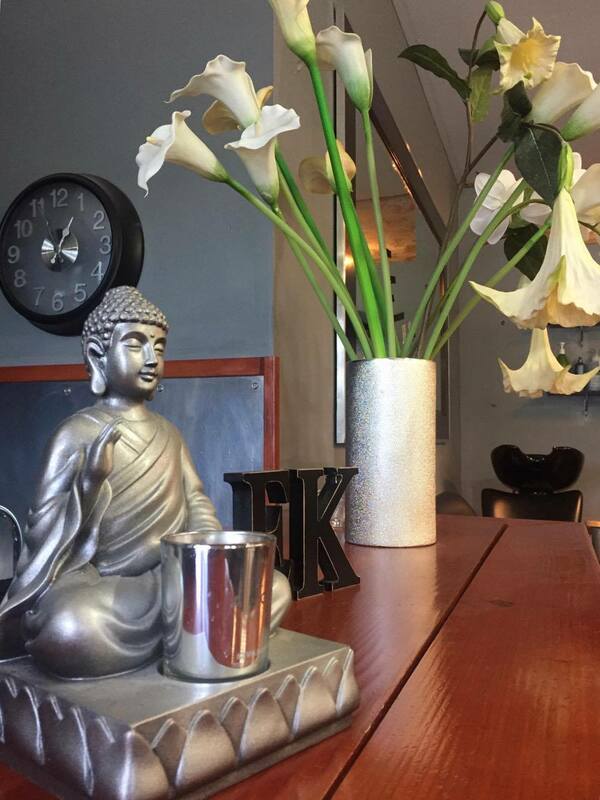 Thank you for visiting EK Hair. We know you have a choice in choosing a salon and appreciate your business. The following information is intended to make your visit as enjoyable as possible. 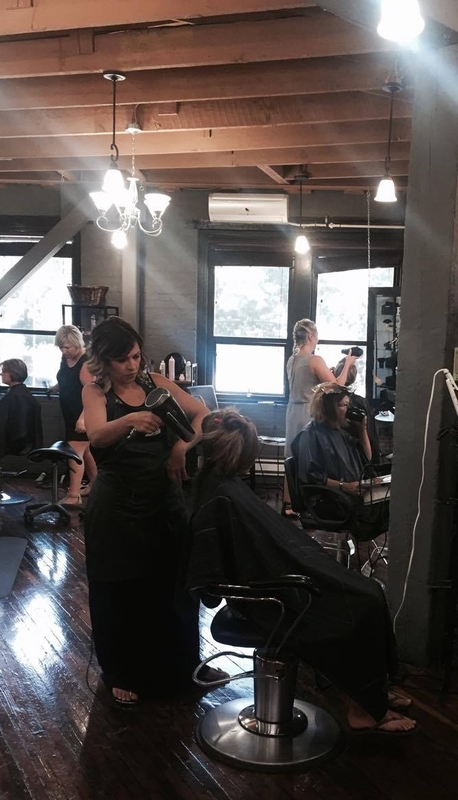 Walk-ins are always welcome, but without an appointment we can only accommodate you to our best. Calling in advance is always recommended so that you may secure the day and time that works best for you. Arriving early will allow you to enjoy every minute of your experience. If you do arrive late, please know that your service will still finish at the scheduled time, and the fee will remain unchanged. Life happens and we understand appointment cancellations but repeated no shows will be asked to pre-book any further appointments with a credit card.Gift Certificates. We require 24 hours notice when canceling 2 hours appointments. Please respect our time as you would your doctor or dentist. We reserve the right to charge a fee of 50% of the original bill for cancellations or no-show's within 4 hours of the appointment. Gift Certificates are available in any amount. To be redeemed, they must be presented at the time of service. We are not responsible for lost gift certificates and they cannot be refunded. Products, with receipt, may be returned within 7 days of purchase for a credit. The prices listed on our brochure and website are listed in price ranges, as each member of our team maintains separate pricing. The prices are subject to change without notice. Tipping is never expected, but always appreciated. The best gratuity is always referrals! In order to better service our customers, we invite you to share your comments and suggestions.